One of the most common uses of permanent magnets is for creating the magnetic fields in electric motors. The only way to try new concepts or to optimize an existing design is by either finite element or boundary element simulation. Advanced winding features which enable the designer to include winding diagrams in the finite/boundary element analysis. For brushless DC motor electromechanical simulation it is usually sufficient to conduct a 2D design analysis with MAGNETO . If it is necessary to include the effects of flux leakage at the ends of the motor, then AMPERES should be used as the CAE software. 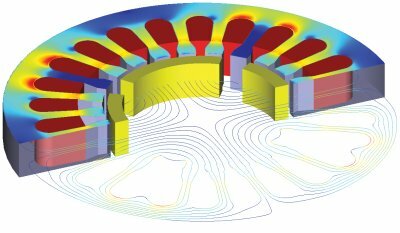 For induction motor simulation it is usually sufficient to conduct a 2D design analyis with OERSTED . If it is necessary to include the effects of flux leakage at the ends of the motor, then FARADAY should be used as the CAE software. Conventional dynamic cone loudspeakers can usually be analyzed using a MAGNETO RS model. More exotic shapes may require AMPERES, and loudspeakers employing electrostatic forces may require ELECTRO or COULOMB. The Boundary Element Method has a particular advantage for this application because of its ability to generate extremely accurate air gap field analyses.